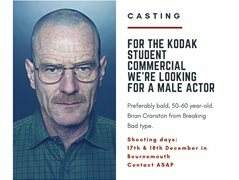 For the Kodak commercial student competition, shot on film at Arts University Bournemouth by students of 2nd year's MA Film Production, we are looking for a male actor. It's a unique opportunity to be part of a commercial shot on 16mm film that will be assessed by people working in the industry! The character is mixing ingredients in a lab. We are searching for an actor who can express a wide range of emotions without dialogue, preferably bald (Brian Cranston from Breaking Bad type).